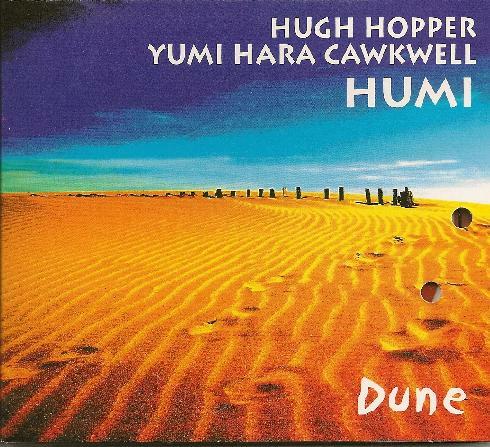 Humi (Hugh Hopper & Yumi Hara Cawkwell) - "Dune"
Imagine the soundtrack for an abstract cartoon and you'll be close to where Humi are nestled. They explore the boundaries of improvisation/experimentation and they strive to expand on the natural cycles, taking bass, vocal, and piano, to new levels. The atmospheres are spacey and ambient. The compositions enchanting and surreal and I find it mellow throughout. It is jam packed with the strange and the headf**K stuff. The production is excellent, and the whole CD flows like a torrent of sound, flashing its arse to the classical world. However, most of the tracks feature piano tinkling around with no real substance piece to play. When not piano, a vocal torment accosts you, almost solo, with minimal very low bass rumbling in the background. Other tracks are organ driven, bass meandering, with backwards stuff and pitch adjustments. It is interesting stuff, but after 20 minutes you would expect something to have worked its magic on you. Alas, it has not. The latter half of the album however moves better the first, but most of the compositions are quite boring in honesty, and the tracks are slow to evolve, but at least they do evolve, even if it is ever so slight. The only thing that gets me is, after reviewing a handful of similar sounding improvisation/experimentation CD's this edition, for top class professional musicians, I cannot tell them apart from home recording artists, and in most cases, creativity seems to flow more from those who do not have a top quality studio to record in.